Fabulous Fudge is so easy to make it’s almost embarrassing. This quick and easy recipe came to me literally on a plate. A plate with three kinds of fudge dreams to delight the tastebuds. And, such a sweet friend, she included the basic recipe! Make it once and it will become your signature gift, too. The directions started “Line an 8×8 pan with waxed paper, covering the bottom and up the sides. Do NOT skip this step or you’ll be sorry!!! !” No, she didn’t mean armed thugs show up at your door threatening to break your legs. It’s just that the fudge will come out of the pan in messy spoonfuls instead of beautiful, giftable squares. I’ve started using non-stick aluminum foil instead of the waxed paper. Releases the fudge well and is stronger for lifting out of the pan to the cutting board. It’s easier to cut precise squares for gifting on the cutting board than the pan. Chocolate chips are often sold in 12 oz bags, so you will need one and a half bags for this recipe. The easiest way to be sure you have enough is to measure out 3 cups of chocolate chips from whatever size/s bag/s you bought. Use semisweet chocolate chips or dark chocolate chips or a combination of the two. Put ingredients into a shallow microwave safe bowl so ingredients heat uniformly and can melt together. Cut the butter into smaller pieces so it will melt quicker. Microwave on high for 1 and one half minutes (90 seconds), stirring after each thirty seconds, bringing up the melted mixture from the sides and folding it in and then stirring widely so what was in the middle moves out to the sides. Not as complicated as it sounds! If necessary, microwave up to one additional minute. Pour into your prepared 8×8 pan. Garnish with nuts or candy or leave plain. Refrigerate for at least two hours so it is set. Yes, you can speed up the process by putting it in the freezer for an hour – not long enough to freeze, but until it sets well. Cut and package beautifully. Gift worthy of kings and the royalty in your life — neighbors, friends, coworkers, teachers, mail carriers and anyone else who deserves a royal treat. 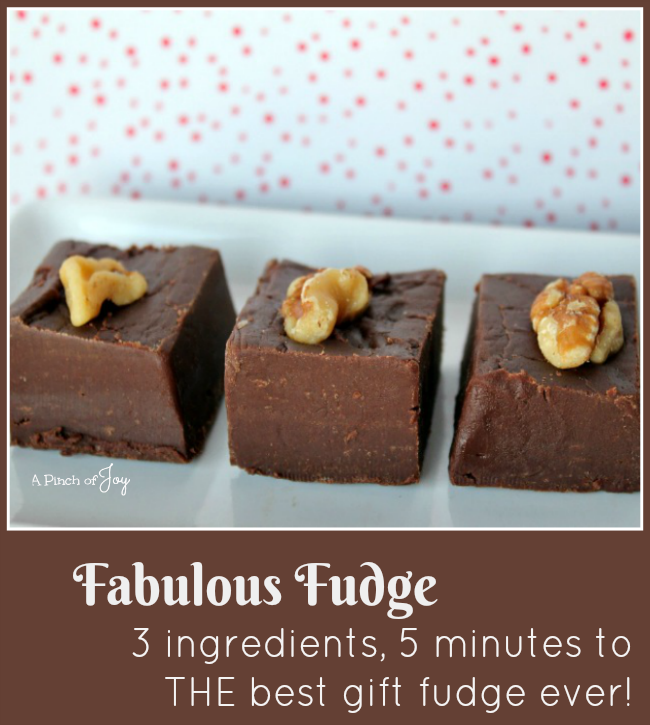 Fabulous Fudge - 5 minutes, 3 ingredients. 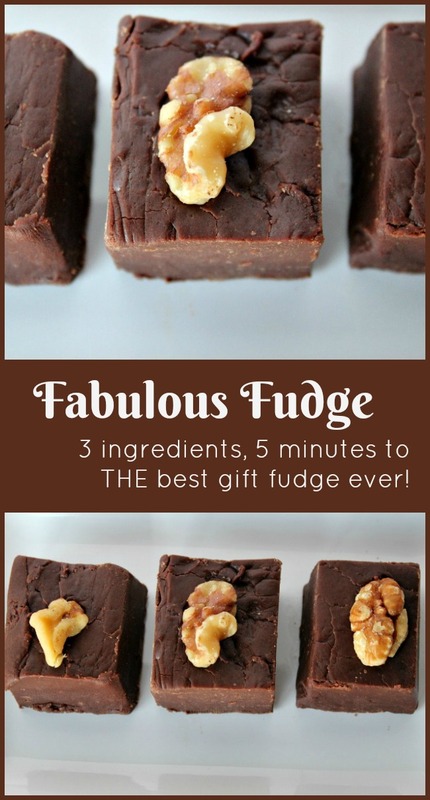 THE Best gift fudge ever! Awesome, smooth and oh, so chocolaty, Fabulous Fudge only takes five minutes and three ingredients. A gift for the royalty in your life! Line 8 x 8 pan with waxed or parchament paper OR non-stick foil across the bottom and up the sides. Spray lightly with cooking spray. Do not skip this step! Pour all ingredients into large shallow microwave safe bowl, microwave on high for 90 seconds, stirring after each 30 second interval. If needed, microwave additional 60 seconds. Pour into lined 8x8 pan, smoothing into corners and making an even layer of fudge. Refrigerate for about 2 hours until firm before lifting from the pan and cutting.